American English Coonhounds is an often misunderstood breed as they are used widely for hunting in America and South Africa the actual temperament of the breed is often overlooked. American English Coonhounds are excellent working dogs but also make great family pets as long as they are exercised regularly. They are an extremely loving breed and will take over your couch and bed if allowed to. 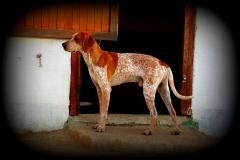 Asharah Stud currently has 4 American English Coonhounds making up our stud. Taylor Made Grizzly Taylor of Asharah Stud is a USA import from Taylor Made Kennels in Kentucky USA, Taylor is red tick who came from a hunting farm near to Swaziland, although not raised with our pack he has fitted in well even accepting the cats and the horses in the household. He has a quiet calm temperament and is eager to please. Taylor is the Sire to our first litter of puppies born 20th June 2017. Gamestalker Grizzly Jasper of Asharah Stud - Jazzy is a blue tick was bred locally in South Africa, He is a very affectionate dog and is always at my side. It is Jasper I am doing tracking and protection work with. 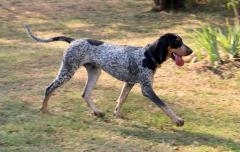 He shows exceptionally well and has made a mark for the South African Coonhounds in his short showing career. Our Girls - Grizzly Amber of Asharah Stud - the one who started it all, Amber is very much a peoples dog and loves being with her humans. Shes fascinated by children and will stay by them all the time given the chance. Amber is mummy to our first litter. Gamestalker Grizzly Sapphire of Asharah stud - Saffy - is a sweet hound with a naughty streak. She is very bouncy and enjoys living every moment of life. She is a clown and keeps us highly entertained all day. We are a very open stud and invite you come and learn more and meet the hounds at any time. KUSA registered puppies occasionally available to selected homes. Taylor made grizzly Taylor of Asharah. 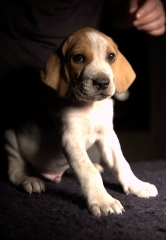 The American English Coonhounds were originally bred from bloodhounds, foxhound and other breeds to create an athletic hunting hound to track and tree racoons. They have powerful voices so the hunters know when they are on a scent and calls change once they have treed the racoon. People often think that because of this they wont be good family pets and cant be around smaller animals. However if raised correctly they make excellent family pets, get along well with other pets and have proven to be a protective and loving member of the family. They are great running partners due to their stamina, as much as great cuddle partners who just want to be around their family all day. Puppies will be microchipped, vaccinated and dewormed before going home at 10 weeks. We place breeding restrictions on the puppies this can be discussed under the correct circumstances. Buyers will receive the puppies KUSA papers. The kennel name, "Asharah" is registered with KUSA.